Decided to fire up another sour mead this last week. This time without any brettanomyces or pedioucoccus. 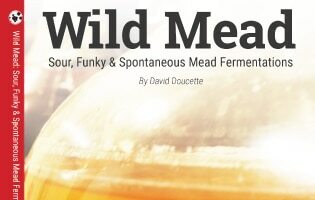 I’ll be souring this mead exclusively with L. Plantarum caplets. 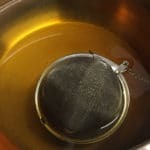 This allows the mead to develop a nice sourness without relying on pedio, which produces a lot of acid, but requires the addition of brettanomyces to break down its byproducts. Once the mead’s pH is down to a respectable crisp sourness (I’m not looking to go too crazy), I’ll pitch the yeast, and add about a pound of red grapes to help the body. 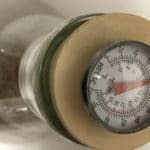 Recipe units for 1 gallon of sour mead. I mixed up half a pound of honey with a gallon of water to create a nice healthy lacto starter. At a warm temperature, fresh capsules can finish acid development in around 24-48 hours. Since my caplets were old, I added ten (5 at first and then 5 more after seeing a very old MFG date), and let the acid develop on its own for 5 days. Once the acid is at an appreciable amount (mine is around 4 pH now), add the rest of the ingredients and pitch yeast with 1/2 tsp of yeast nutrient. I use a different nutrient schedule for hydromels than I do for regular strength meads. I also created a little process video for my Youtube Channel below. Acid finally developed to a reasonable amount after 5 days. This was because the MFG date on my L. plantarum caplets was a year ago. It’s definitely something to watch out for when shopping around for “vitamin bugs”. I’ll add the grapes, honey, and wine yeast tomorrow. From there it should be finished in a pretty quick timeline. Gravity after 7 days (2 days with wine yeast) was down to 1.030. I’ll just let it ride out and go from there. It’s mildly acidic, but doesn’t have a heavy in your face acidity. I’m going to chalk that up to having old, poorly stored capsules. Next I’ll probably try out one of the WL Berliner Blends and test those differences. Well, we can let this batch stand as proof that brettanomyces is more resilient than some will lead you to believe. There is definitely some rearing its head in the flavor profile of this mead. So it’s now less of a true sour only mead and more lambic style as far as flavor profile goes. Still good, and balanced (not too bretty). I might add some fruit to this one.